Capri condominiums are located approximately one mile from the Florida/Alabama state line. Capri consists of only fourteen four bedroom, four and a half bath units. With over 3,500 square feet of exclusive living space and featuring floor to ceiling doors and windows, Capri condos are some of the most desirable in Perdido Key. Your comfort and privacy are guaranteed by private elevator and security code entry. 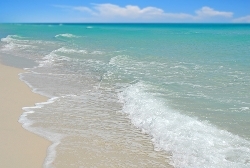 To learn more about condos for sale at Capri in Perdido Key, please contact us. Or keep reading below the current property listings for more information about Capri condos! Sign up now for FREE for complete access to our property listings, including detailed property specs, area maps, photos and more! Registration also enables you to bookmark your favorite properties, share listings with friends & family, and save your preferred search parameters to save you time on your next visit. 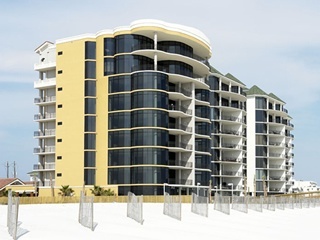 Capri Condos in Perdido Key, FL, though only fourteen units, feature luxury amenities often seen only in larger resorts, such as indoor and outdoor swimming pools, steam room and sauna, hot tub, and fitness center. Access to the pristine and uncrowded beaches of Perdido Key give the fortunate Capri condo owner and their guests the most isolated beach experience possible. Capri Condominiums in Perdido Key are a rare beauty, and are rivaled only by the natural beauty of Perdido Key itself. Famous for its gorgeous state parks, rolling white dunes, and tranquil lagoons, Perdido Key provides Capri a stunning backdrop upon which to enjoy the expansive vistas and sunsets from your huge private balcony. Schedule a showing today to fully appreciate Capri condos! If you're on the hunt for other properties in Perdido Key, see all Perdido Key condos for sale, or check out the area's latest waterfront properties. Contact us with any questions!